So Easy a Caveman Can Do It…. The Paleo Diet has been a trendy diet for the last few years. There are some experts, celebrities and regular folks who swear by the principals of the Paleo lifestyle. For instance, did you see the influx of articles about Lebron James when he adopted the Paleo way such as this one and the one over here? There are also many articles and rumors dotting the web about Jessica Biel, Jack Osbourne, Grant Hill and other celebrities adopting easy Paleo meals as their way of eating. In addition to the many Paleo supporters out in the world, there are also many people out there who have written it off as a fad and voiced their concerns or criticisms. Despite those facts, many people including the Easy Paleo Meals team, are passionate about the Paleo way. As just one example of the amount of people investigating the Paleo diet and trying to find simple Paleo meals to eat, the editors over at Live Strong are saying that in excess of one thousand Paleo diet recipes have been submitted to them via their MyPlate app as people attempt to determine the nutritional information (e.g. calories, fat, protein and carbohydrates) of their chosen Paleo meals. Many websites and reputable news organizations have written many articles regarding the popularity of the Paleo diet and its benefits. Although many have attempted to cover the topic, there are many misconceptions and questions remaining with regard to the Paleo diet and the foods that are incorporated and eliminated from the lives of followers. What Is the Premise of the Paleo Diet? Science tells us that human anatomy, genetics and basic nutritional requirements have not changed significantly in the past 10,000 years. This is significant because the introduction of agriculture and engineered foods began approximately 10,000 years ago. If we accept this as fact, the Paleo diet reasons that if we eat and exercise in ways similar to the Paleo ancestors or cavemen as they’re affectionately known, we should be able to maintain a life that lacks disease while also managing/controlling our weight. 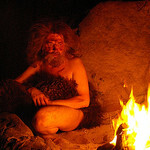 Should I Get In Touch with My Inner Caveman? Many people want to jump on the Paleo bandwagon because it’s trendy. That may be as good a reason as any other, but the general consensus of the Easy Paleo Meals team is that most of us came over to the Paleo way as a method of preventing disease or losing/controlling weight. If you poll our little group, you will find that many of us have certain ailments that run in our families, such as obesity, heart problems and various forms of cancer. As a result, we were looking for a way to avoid those afflictions. Each of us placed our confidence in the Paleo diet to help avoid the diseased fate that befell many of our relatives. This is because many of the foods that are avoided as part of Paleo meals have inflammatory qualities (e.g. processed foods (which can be high in refined sugar), dairy, legumes and cereal grains). As Paleo diet converts, we all have a multitude of positive experiences and stories to share regarding our respective journeys. Feel Free to reach out to us to share your story, ask questions or just leave a comment in the comments section below. Skin improvements including the reduction of acne. Read here to learn about five common items for Paleo eaters that can enhance your skincare routine. The emphasis on increased protein and the elimination of dairy and refined sugars in Paleo meals typically allows followers to reap the benefits without doing much more. However if weight loss is the primary reason for conversion to the Paleo diet, then an increase in exercise can accelerate results. Are There Any Risks to the Paleo Diet? Some people may experience a strain on their kidney function from converting to a high protein diet. As such, anyone with reduced kidney function should consult with a physician before becoming a Paleo eater. The extreme reduction or complete elimination of grains, legumes and dairy can result in a fiber and/or calcium deficiency. Practitioners must look for creative ways to replace these nutrients. Consistently eating higher quality meats and fish, such as wild caught salmon or wild game, may cost prohibitive or even difficult to find in our modern culture. If you’re considering Paleo, it may be useful to research guides and tips for eating Paleo on a budget such as the one we’ve created, which can be found here. How Do I Eat Paleo? Eating Paleo is simple and converting is not as difficult as you may think. Everyone has to decide for themselves what type of Paleo practitioner they will be before specific answers to this question can be provided. Paleo eaters can generally be divided into two categories – strict followers and flexible followers. Just as it sounds, strict followers adhere very closely to the Paleo diet do’s and don’ts that are defined by the pioneer of the Paleo Diet, Dr. Loren Cordain 85% of the time or more. The Easy Paleo Meals team generally defines flexible followers, as those who eat Paleo compliant meals less than 85% of the time. The 85% is important because that is the threshold for eating Paleo compliant meals as established by Dr. Cordain. 4 to 6 oz of lean protein (8 oz if you’re super hungry). This includes turkey, pork loin, chicken, lean beef or seafood. Add healthy fats to your meals. You can do this easily by preparing them in olive oil/coconut oil, adding a handful of nuts or slices of avocado. Consume 3 to 4 meals a day structured this way and you will be eating Paleo before you know it. If you need a jumpstart to eating Paleo, our team has compiled a FREE 7 day sample menu, which includes recipes for 21 easy Paleo meals (breakfast, lunch and dinner for seven days). This sample menu can be found here. Also consider picking up a cookbook of easy Paleo meals. We recommend The Paleo Diet Recipe Book and The Paleohack Cookbook for Paleo newbies and experienced Paleo eaters alike. Having a wide variety of meal options helps people stay on the Paleo diet. Do I Have To Exercise on the Paleo Diet? Because the Paleo lifestyle seeks to mimic the activity of the hunter-gatherer period, exercise is generally considered par for the course. Imagine hunting for your food or running to escape a mastodon, thus exercise was built into the lives of the Paleolithic era humans. Now, we get food from stores or markets and generally we are not being chased by large, wild animals. As a result, we create opportunities for exercise in modern life. In a nutshell, eating easy Paleo meals and adopting the Paleo lifestyle can benefit your health and quality of life. Prior to converting to the Paleo diet the potential risks should be evaluated and discussed with a professional, if necessary. Learning to prepare easy Paleo meals is essential to your success on Paleo and while exercise is not a must, it is certainly encouraged. Combining the easy Paleo meals and Paleo exercise yields the best results and can help lead you to your best life.